When Advanced Plasma Solutions develops cutting-edge plasma applications, the world notices. Take, for example, South Korea. One of the most technologically advanced nations on earth, this tiny country with the tiger economy has a keen interest in thermal plasma and its potential to generate energy more efficiently. 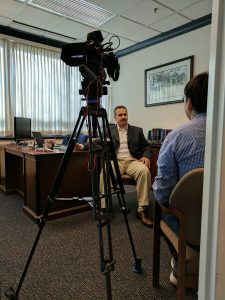 On March 3, a journalist from the Korean Broadcasting System (KBS) interviewed key APS staff at its Malvern, Pennsylvania headquarters for a documentary about the Drexel University Plasma Institute, an APS collaborator. KBS is South Korea’s national public broadcaster and one of its largest TV networks. 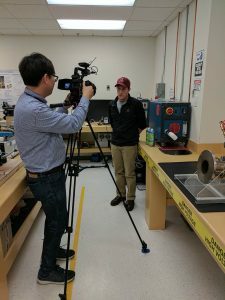 In the APS Plasma Lab, the KBS camera rolled as senior researcher and R&D manager Tom Nunnally, Ph.D., used innovative APS machines to demonstrate how plasma catalyzes the molecular chemistry of hydrocarbon into energy. The technology promises exciting applications in areas such as waste management. Nunnally also activated an APS water treatment system that converts a combination of gas, air, and water into plasma-treated water. This powerful product has attracted international interest for its potential to grow healthier, more abundant plants using less land. Managing partner Simon Kassas, Executive Vice President of Business Development and Marketing, entertained numerous KBS queries about APS. He shared enlightening information about the company mission, its development and commercialization of plasma-based products, and the APS leadership role in introducing nonthermal plasma technology to commercial and technology companies. The documentary will air throughout South Korea in late April 2017. Americans also may view the program online on a date still to be determined. Stay tuned for further information. Contact us to learn more about being featured on KBS or about plasma technology.